A search engine results page displays a lot of different information; in fact, you may not even be aware of all the different types of results you get. From vertical search engine results to related news stories to suggested spellings (if yours is a little rusty), the results page offers all sorts of ways for you to dig deeper into a subject. Say Mother’s Day is coming up, and you want to buy your mother a nice bouquet of roses. (Good for you! No wonder Mom always liked you best.) 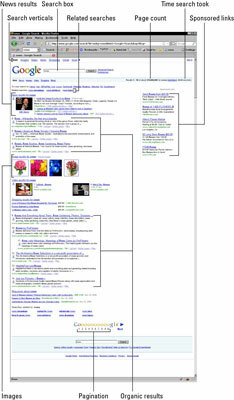 After going to Google and typing your roses search query into the box, you’re presented with a results page. The results page contains many different listings containing the keyword, or search word, roses, sorted according to what Google thinks is most relevant to you. The following figure shows a Google results page for the query roses. Search Box: The box where you type your search query. In this case, it’s roses. Search Verticals: Links to the vertical search engines, the specialized ones that narrow your search into a specific type of result, such as news or images. Clicking one of these links takes you to a results page with only news or only images. Page Count: The number of Web pages Google found that match your search query in some way. In this case, it’s a lot. Time Search Took: How long the search engine took to retrieve your results. Related Searches: Other topics that contain your query or other searches Google thinks might be relevant. Images: Picture files that match your query. This comes from Google’s Images vertical engine. Clicking the link would take you to the vertical search results — in this case, a page containing only images of roses. News Results: Any news results pertaining to your query or containing a keyword. These come from the vertical news engine. Clicking the link would take you to the news page. Sponsored Links: The paid ads. Note how some of them relate to a specific geographic location near you. This is thanks to the local vertical search engine. Organic Results: The listing results from a general search of Google’s index, with algorithms applied to determine relevance. Pagination: Links to the additional pages of results. Disambiguation: (not pictured) The “Did you mean . . . ?” suggestions that usually display after a misspelled search query or search queries that turned up very few results. It’s Google trying to guess what you actually wanted. Because roses was spelled correctly, no disambiguation appears in the figure. You can test this feature for yourself by searching for rozes in Google.